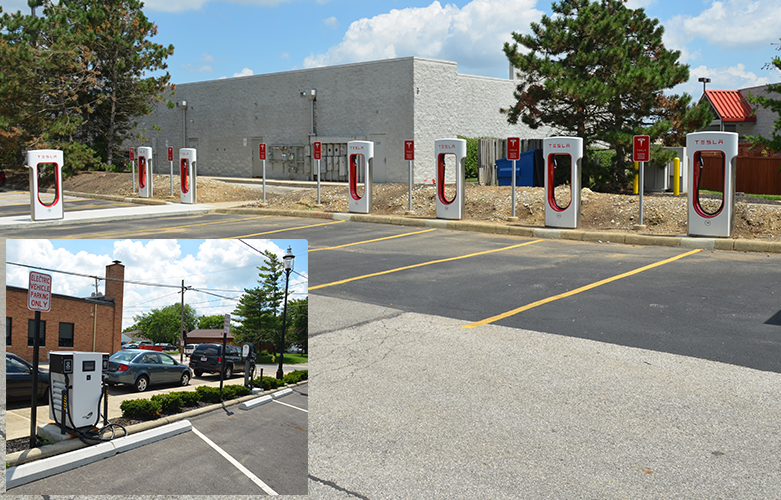 Grove City is home to two options for electric vehicle (EV) charging. With the cooperation of Nissan, EV charging stations have been installed at 3383 Park St. in Town Center. This facility has four charging ports for all brands of electric vehicles (special adapter required for Tesla vehicles). Charging options include both a 4-hour and a rapid 20-minute charge option. EV owners can plug in and charge their vehicle while visiting the shops, restaurants and other Town Center attractions. This service is currently provided free of charge. Tesla Motors, an automobile company that designs, manufactures and sells electric cars recently opened an eight-port, EV charging station for their Model S vehicles in the Derby Square Shopping Center, 2221 Stringtown Road. Tesla vehicle owners are able to plug into the station and charge their vehicle free of charge.